The entire evening sky would be in the palm of my hand." 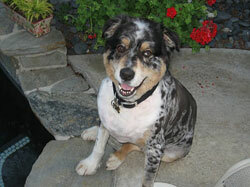 It is with deep sadness that we share with you that Toby died on November 19, 2009. He succumbed to the disease and its complications after nearly a 7 year battle. He was brave and loved life until the end in spite of this cruel disease. He inspired us always! He remained bright and alert but it was his body that finally gave out. He died peacefully surrounded by love and that is all we could ask. He is free now! He never complained and was so happy for the littlest thing you did for him. 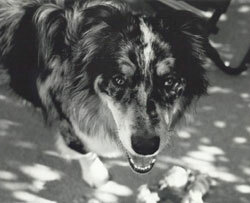 He was the sweetest, smartest and most loving dog we have ever had the privilege of knowing and sharing our lives with. For us he was more than just our dog'he was our boy! We will miss him every day for the rest of our lives. Time Passes Friends come and go. ASHGI wrote a moving tribute to Toby, describing him as "one of the most significant Aussies of the past decade..." Click here to read the full press release. Click here to view our full newsletter in memory of Toby. Click here to view the the Dutch ad in memory of Toby. Click here to view our ad in memory of Toby. 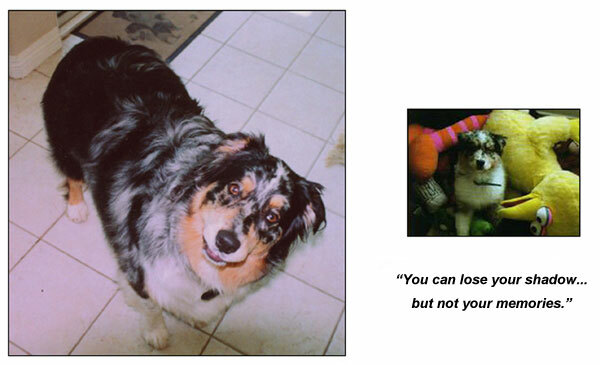 Click here to view ASHGI's ad in memory of Toby. Where I go, ye too shall dwell. Ye will wonder why ye wept"
We received this poem after Toby's passing and it was very moving in describing this journey we were on with Toby for 7 years. I would have carried you to heaven if I could have. Yet a softness that soothed our souls. moment that made your heart mine and my heart yours. "Some people only dream of angels, you held one in your arms." your heart was big and your soul radiant. I would have thanked you for sharing your life with me. We would have reflected on our journey, our family, our friends. You tightly as if to never let you go. Handed you over at heaven's gate. I would have told you, "It's ok to go for we will meet again." I would have if I could have, but I didn't have to. As I can hear you telling stories from heaven above. The memories and the joy of knowing you live on in my heart. Thank you for the journey of a lifetime. flowers bloom, it's always spring, and all the good dogs go." And the love that they gave us never departs." It came to me that every time I lose a dog they take a piece of my heart with them. And every new dog that comes into my life gifts me a piece of their heart.